‘Member a few weeks back when we threw down a batting glove at America’s favorite news host/presidential candidate? Well, that’s still pending. But in the meantime, the BTS Report holds the court and we’re issuing a new Streaking challenge. Here’s a hint: he’s an action hero, a rap superstar, a philosopher, an honorary U.S. Deputy Marshal and the 2000 NBA MVP. He slept in a Superman bed well into his 30’s. 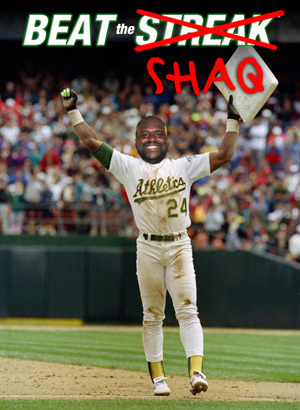 A man of many, many names who really needs just one: Shaq. That’s right, Diesel: we hear you’re going to have a little more time on your hands. How ’bout a 1-on-1 Streak game? We’ll play pickup rules — first to five wins, call your own fouls, rims with no nets. DM @MLB if you think you’ve still got game. Streakers: Get at the Big Aristotle/Shaq Fu/Shaqtus/Wilt Chamberneezy and let him know you want to see a 7’1″ man make a pick. Please do not inquire as to how your Streak tastes. Did he run out of jokes? Or did Shaq smash the leaderboard? Highest “No Selection” 🙂 pg# 9 with streak of 15 back to zero. Well I guess LaVolpe is rooting against me today since I went with the leader’s pick. 4th-inning single moves me onto 4! I went with Jhonny Peralta of the Detroit Tigers today for the hitters and Nelson Cruz of the Texas Rangers today for the pitchers. I took Jeter today based on his numbers off of Ervin Santana. He broke a 15 game streak I had earlier, he better not let me down again. Highest “No Selection” 🙂 pg# 3 with streak of 18 back to zero. Oops, above listing is for Saturday, not Friday. So far this weekend has just been average with 23% falling yesterday and nearly 20% today. Near bottom of the heap, personally I’m hoping for some big upsets on Sunday; a lot of last AB hits saved a ton of people today. damn, I am pretty pissed that I switched from Moreland to Peralta towards the end of my analysis. that is 2 “second-guesses” in the last 12 days. I should be at 12 now, instead of 0! At least Cruz came through in HR BTS! My problem seems to be that it is always easy to make winning picks each day, but as my streak gets longer and longer, I always trick myself into thinking that if I analyze further, my picks will be even safer and that is when I go 0 for. Maybe that is why my career best streaks always come in the summer, when I am busier. Sundays are days of rest for starters sometimes. May want to check the early lineups and rotoworld to make sure your pick isn’t benched & potential pinch hitter later. Survivor: Where is this contest? Odyssey: Why did this contest never start? It drives me crazy to not even know what it would have been about! Highest “No Selection” 🙂 pg# 6 with streak of 16 back to zero. 1at AB single by Bruce moves me to 1!